With annual sales volume exceeding $60B annually, Printed Circuit Boards (PCBs) are big business…$60B in 2012 alone. They’re found in electronics around the world, from smartphones to supertankers to sweatshirts. There’s little that isn’t somehow connected to the PCB. With so many applications, and such high sales volume, it makes sense that manufacturers are seeking out ways to speed up production while cutting costs. Printed circuit boards require quite a bit of information on them. 2D and UID codes, barcodes, serial and batch numbers, and business information and logos are often needed by the manufacturer to keep work orders together, and by the end user manufacturer to identify final products. Several methods for marking PCBs have been used but the most efficient way is laser marking. Laser PCB marking is non-contact and requires no inks or chemicals, which is both good for the environment and your bottom line. CMS Laser’s PCB marking systems also allow you to mark a repeatable mark or a sequential number, such as a serial number. This capability allows you to connect our systems to your data sources which provide the information in real time. Highest quality laser marked ECC200 2D Matrix codes available. Higher repeatability marking on board arrays. Higher marking head positioning of 20 inches per second between array circuits. Modular marking beam delivery system, no component parts to repair or adjust. Sealed marking beam delivery system. Smaller 1 meter wide footprint accomodates boards up to 20″ x 20″. Enhanced user friendliness with easy to use touch screen operator interface. The award winning, fourth generation of Control Micro Systems industry leading PCB laser marking systems introduces significantly improved speed, accuracy, ease of operation, and integration. All of our systems utilize high speed galvo steered lasers to mark any combination of: 1) QR codes 2) IDM square matrix codes 3) Rectangular matrix codes 4) ECC 200 2D matrix codes 5) UPC, Interleave 2-of-5, 3-of-9, 128 and EAN barcodes 6) OCR machine-readable text 7) Alphanumeric text (various fonts) and serialization 8) Graphics and logos 9) UID, SMEMA, CDRH compliance Unlike our competitors, we provide PCB laser marking performance specially tailored to each customer’s unique needs in high-performance, reliable and cost-effective package. Our systems can be stand alone or can be integrated into your already automated production line. Systems can be designed to use automatic stackers, flippers, or any other kind of part handling system. See the PCB Marking system detail page for more features! Application: Engraving resist on both sides of printed circuit boards. 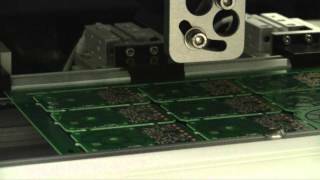 CMS Laser builds PCB marking systems that fit your business perfectly. From operator-loaded machines to fully automated laser marking systems with board flippers and vision verification, our Applications Lab starts with solving the challenges you face, and designs an application to meet every requirement.